I feel like there are two basic kinds of chicken jars: the juicy kind that uses canned vegetables like artichoke hearts and hearts of palm, and the crunchy kind that uses raw vegetables like asparagus, brussels sprouts, fennel, and if I could find it at the Jewel, I would be making this with kohlrabi too. I feel like the juicy ones are best plated with fruit and the crunchy ones are really good with raisins, walnuts, and parmesan, but as always, your mileage may vary and you are the arbiter of your own food. This peach that I photographed was on the crunchy side, still good, but the one I brought to work the next day was just perfectly ripe, and it was AMAZING. Slice the hearts of palm and pepper, and divide between four jars. Eyeball three-quarters of a third cup vinegar and then measure a third cup olive oil into the cup of a rocket blender, add a pinch of salt and some grinds of black pepper, and whirr it all together. Divide the vinaigrette between the jars. 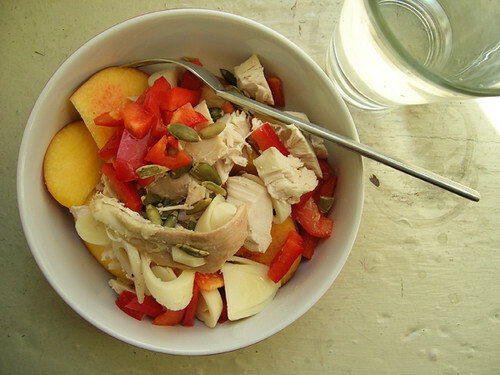 To serve, empty a chicken jar on a plate over a sliced peach. And throw some pepitas on top, why not.